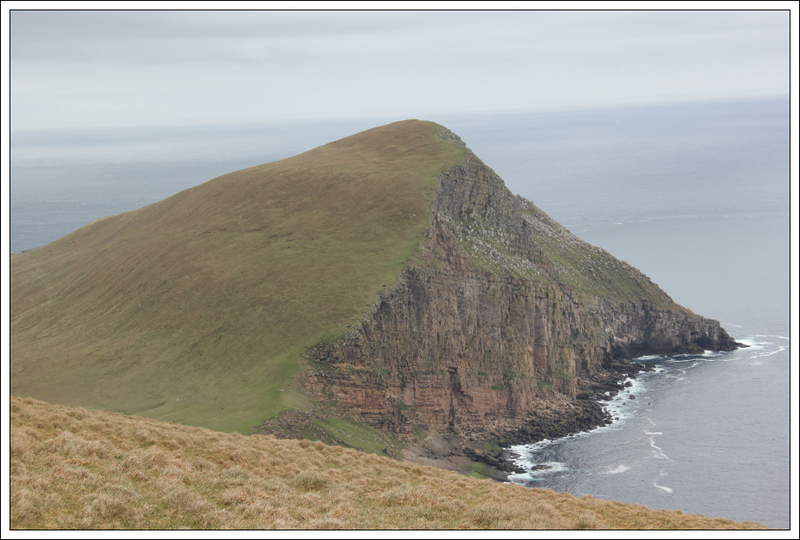 Yesterday we undertook a fantastic peerie adventure to the remotest inhabited community in the United Kingdom – Foula. 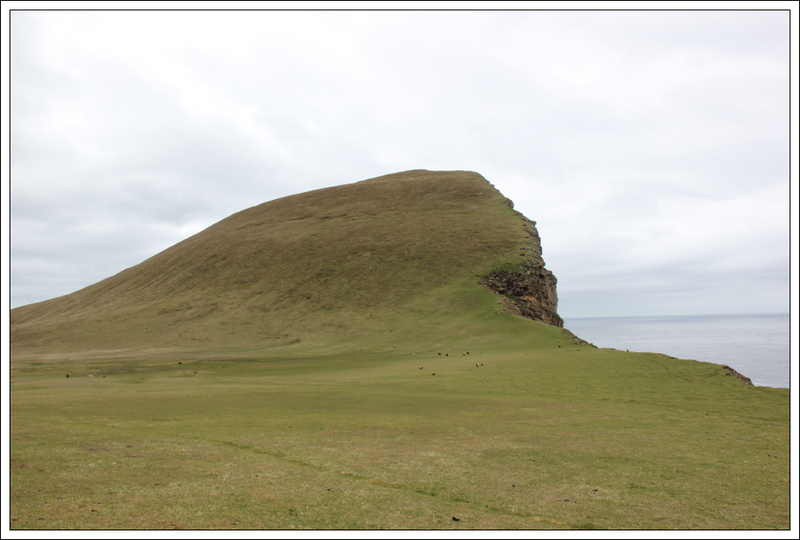 Foula lies 20 miles out in the Atlantic Ocean, west of Shetland Mainland. 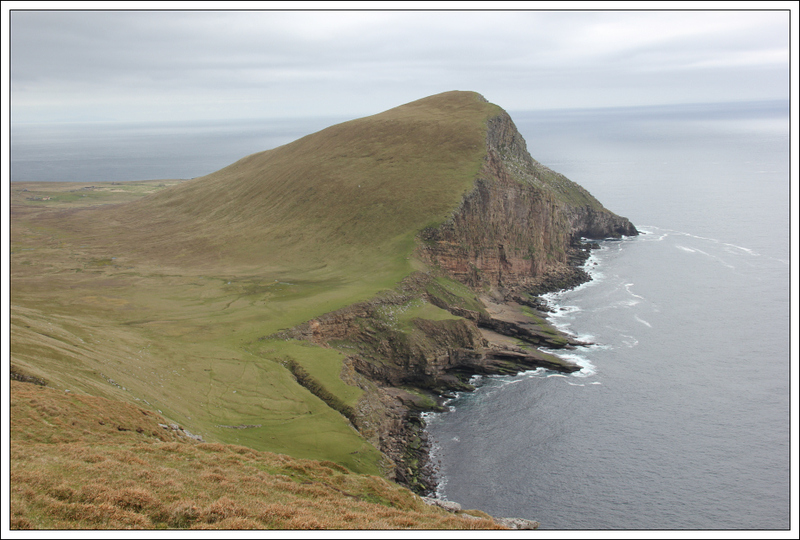 Foula is a Site of Special Scientific Interest (SSSI) both for its flora and fauna and for the geology of its dramatic coastline. 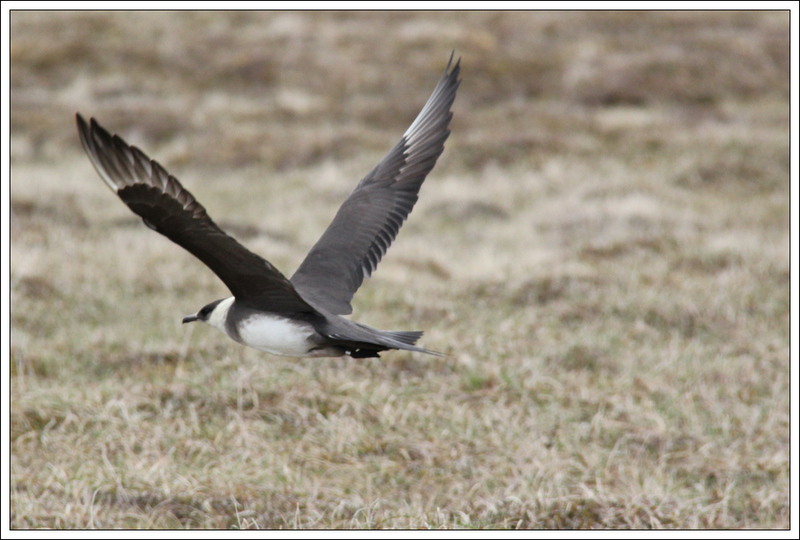 It is also a National Scenic Area and a Special Protection Area for birds. 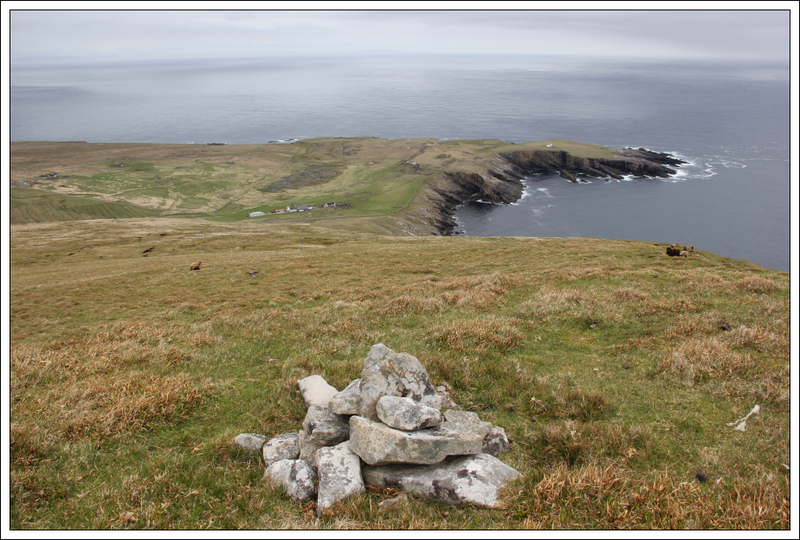 Foula has neolithic field systems, bronze age burial cairns and a stone circle, testifying that Foula has been inhabited for millennia. 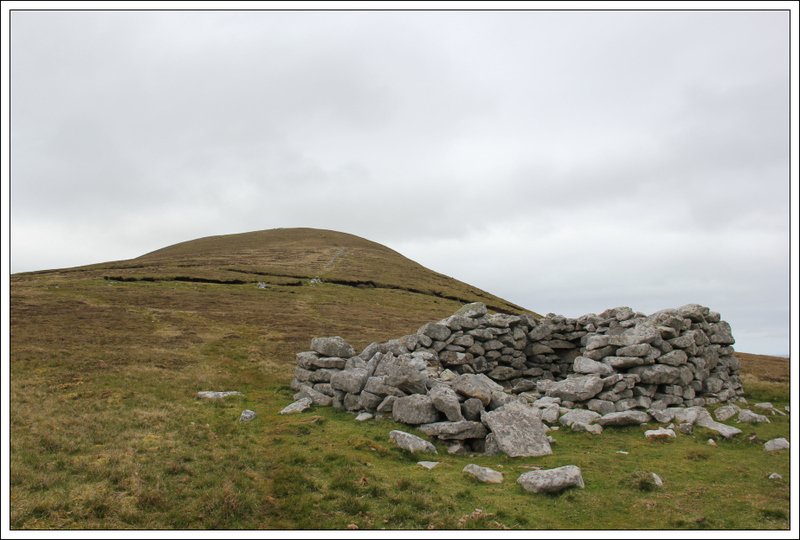 Some time after 800AD, the Norse settled here and their presence can still be felt in the wealth of descriptive Norse place names (either that or Ali G has had a strong influence here). 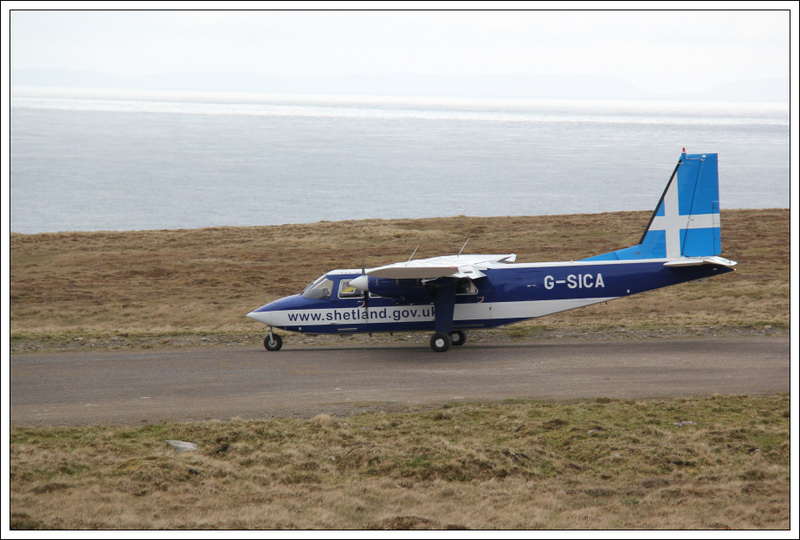 Travel to Foula is completely dependent on suitable weather conditions. 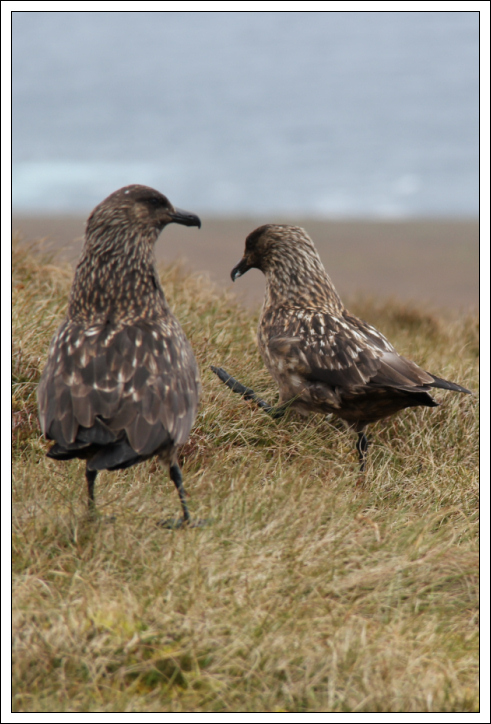 With flights cancelled due to strong winds on Wednesday and Thursday, we were fortunate to have booked the trip on Friday in the calm after the storm. 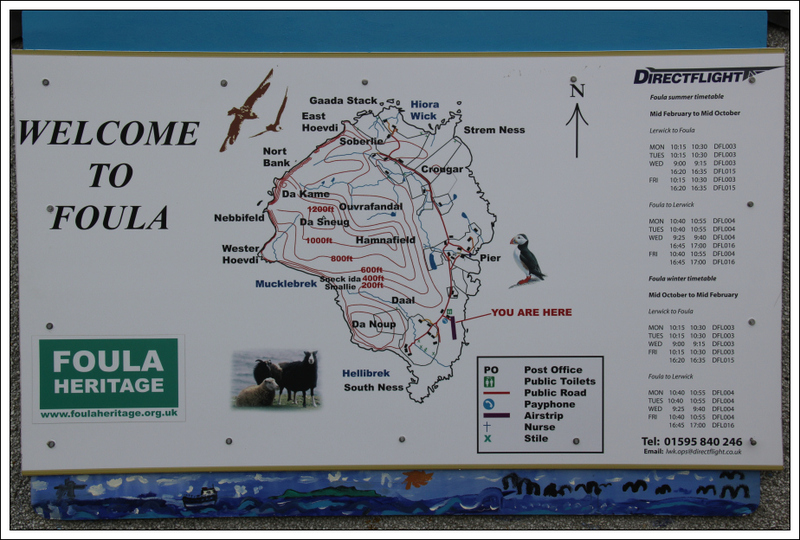 On Friday morning, we drove to Tingwall Airport to catch our flight from Tingwall to Foula. 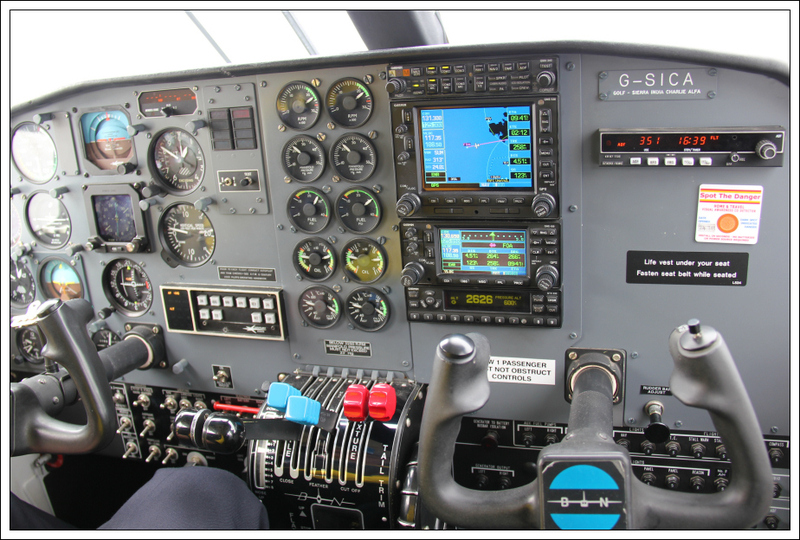 The highlight of this short flight was being asked to sit in the cockpit next to the pilot. 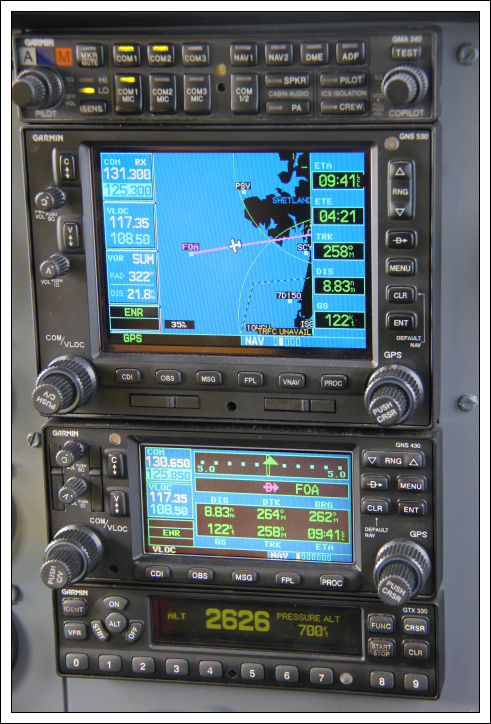 I had to wear a headset and microphone to speak with the pilot but I wasn’t permitted to fly the plane . 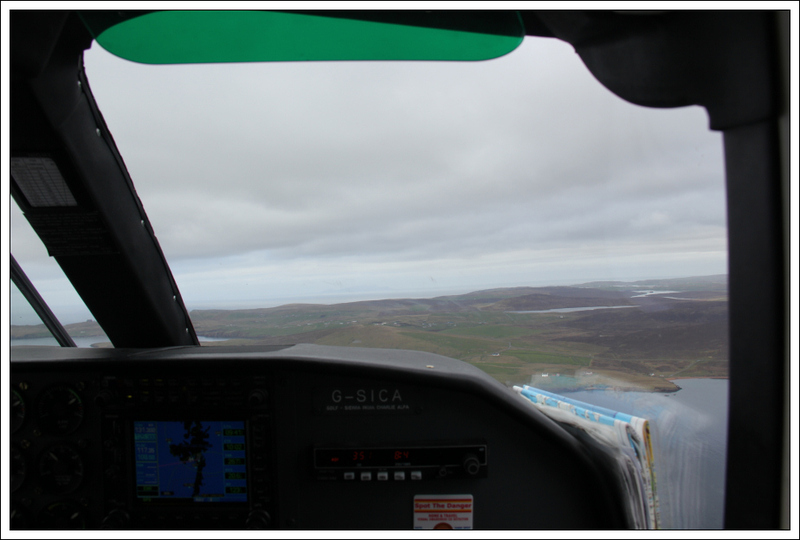 We flew across at a height of circa 1000ft. 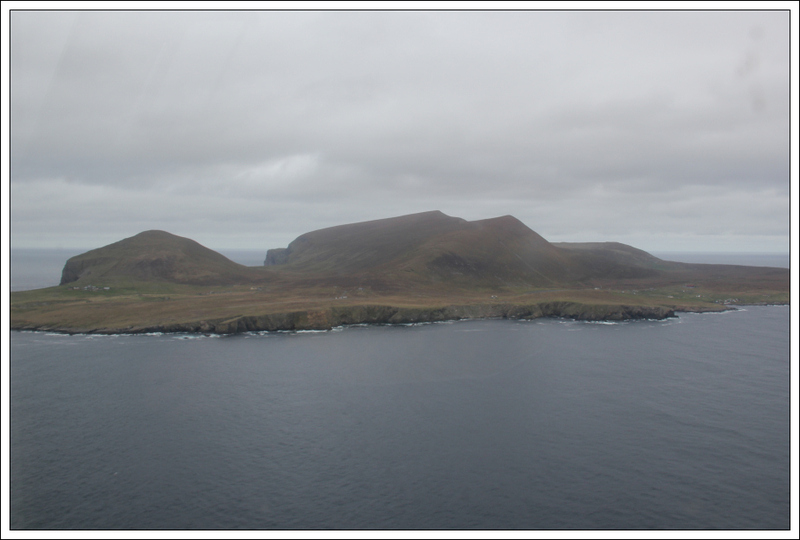 As we approached Foula, I took a photo from the cockpit showing Da Noup and Da Sneug, with the glaciated valley Da Daal lying between them. 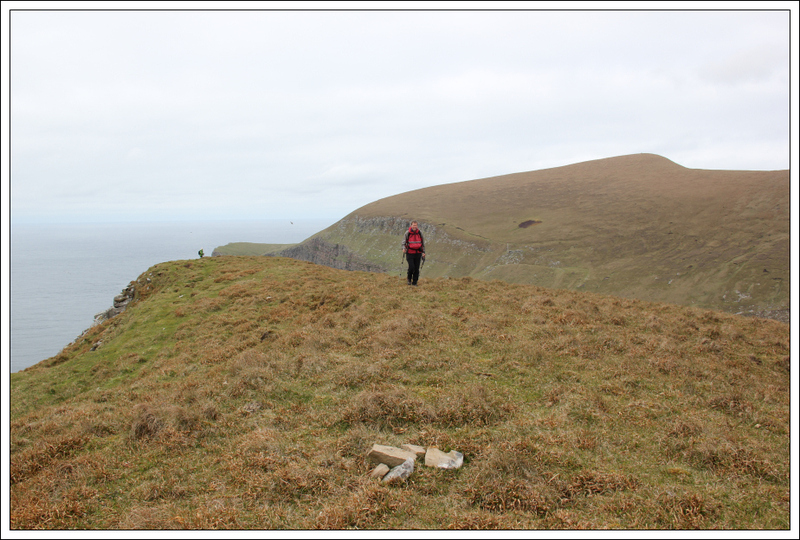 After collecting our rucksacks from the hold we set off walking. 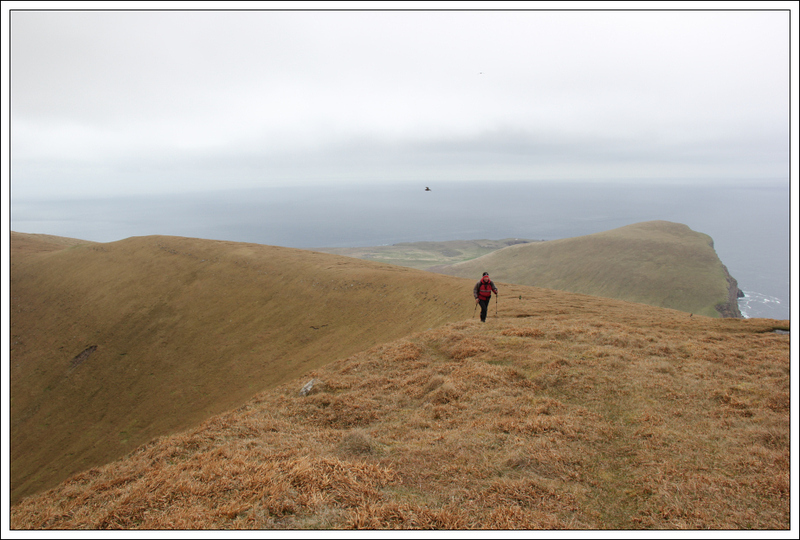 We didn’t have a fixed route in mind for this walk but opted to start off by ascending the nice ridge leading from the airstrip to Hamnafield. 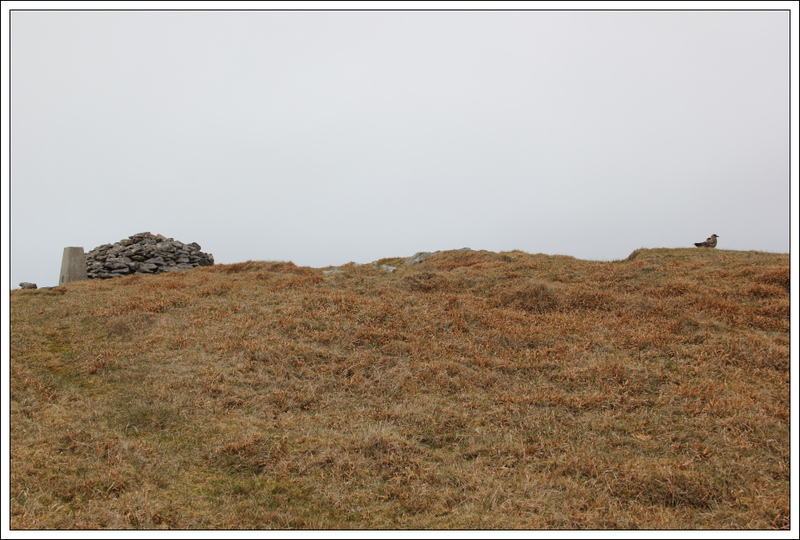 A short distance beyond the airstrip we passed Baxter Chapel. 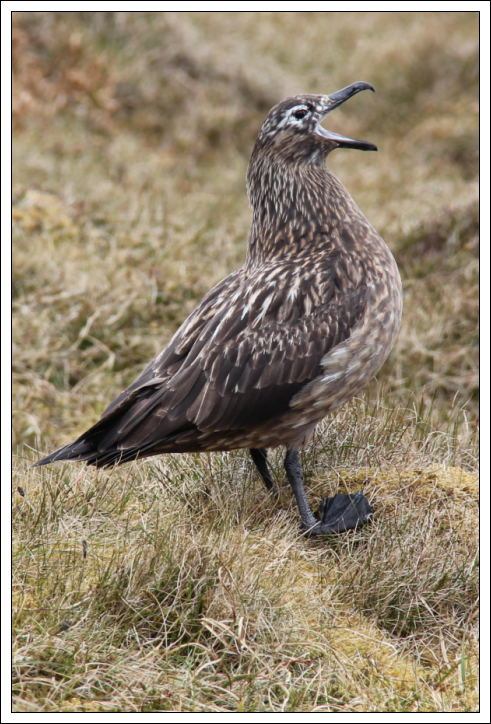 Once on the ridge we passed countless Great Skuas. 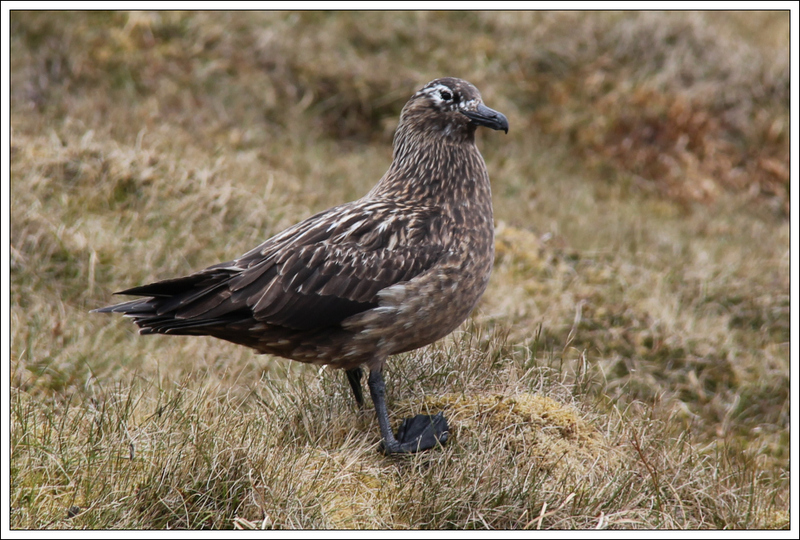 The Great Skuas seemed content to fly off when approached. None of them went into attack-mode. 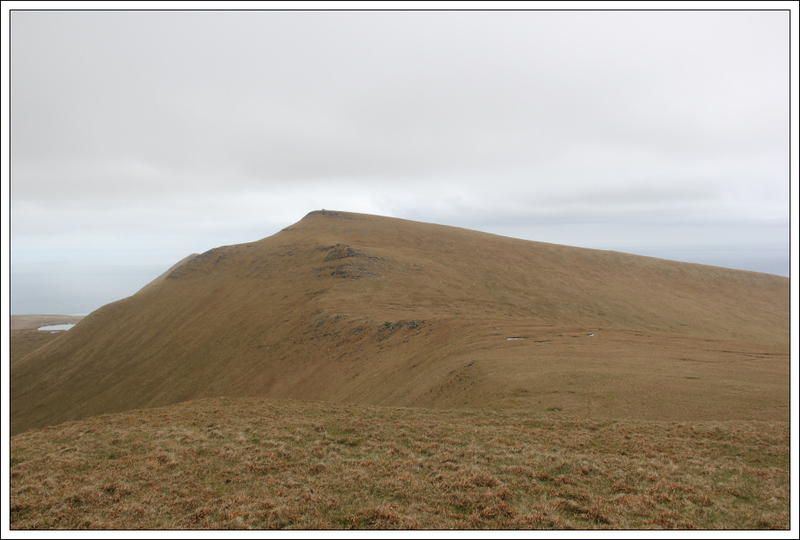 The good ridge made for fast progress, it wasn’t long before we were looking down on Da Noup from Hamnafield. 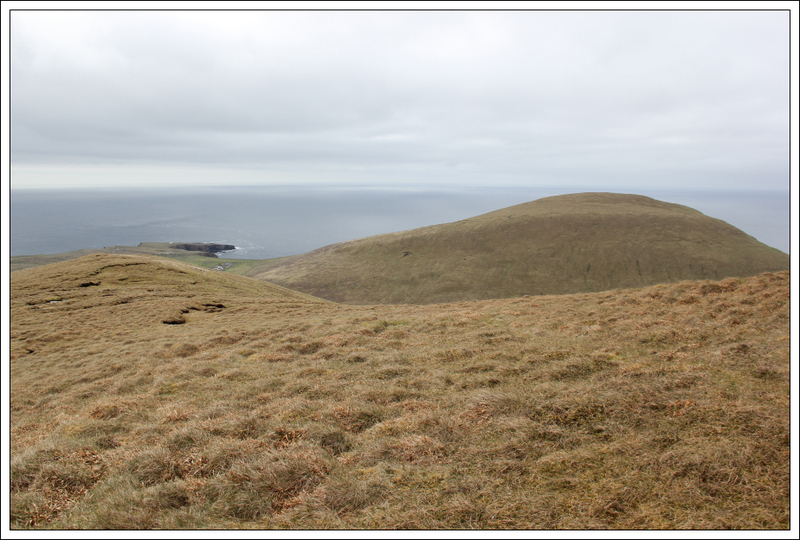 As we traversed the ridge we could see across the much flatter area to the East of the island. 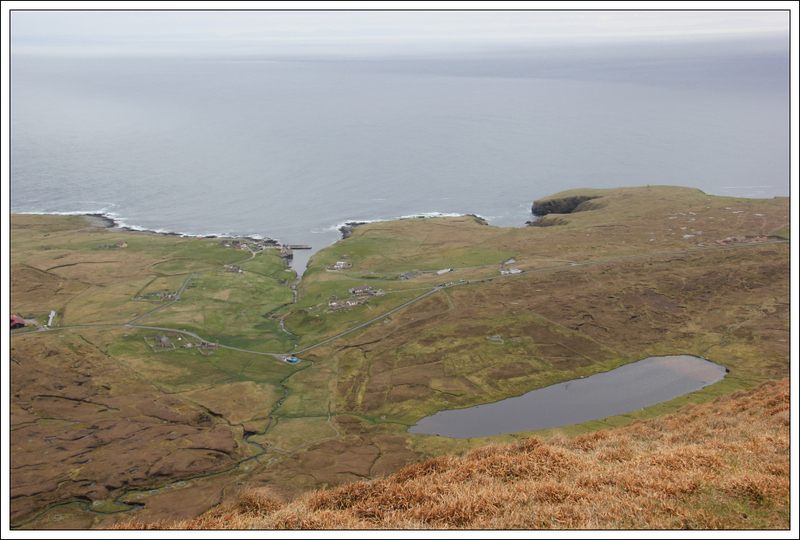 We could see Da Toon o Ham which would appear to be the largest settlement on the island. From the top of Hamnafield we could see that the traverse to Tounafield and Da Sneug would be an easy walk on short grass. 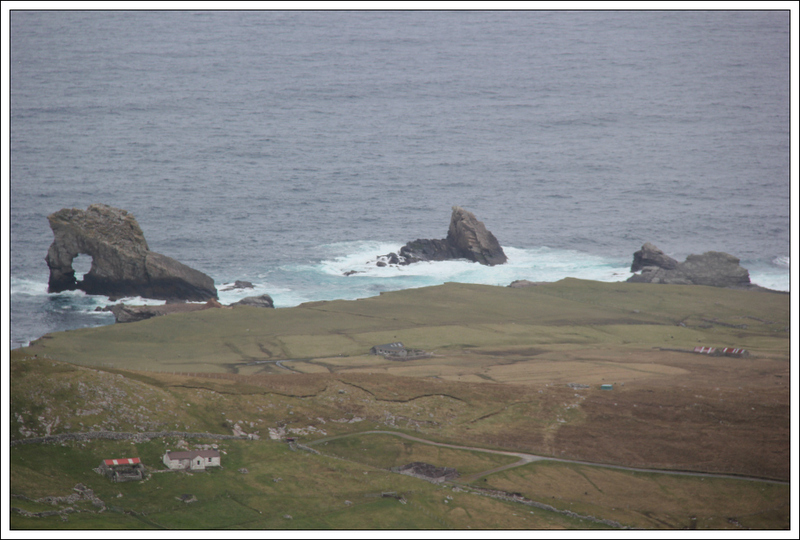 From Hamnafield we could also see some coastal stacks just north of Da Toon. 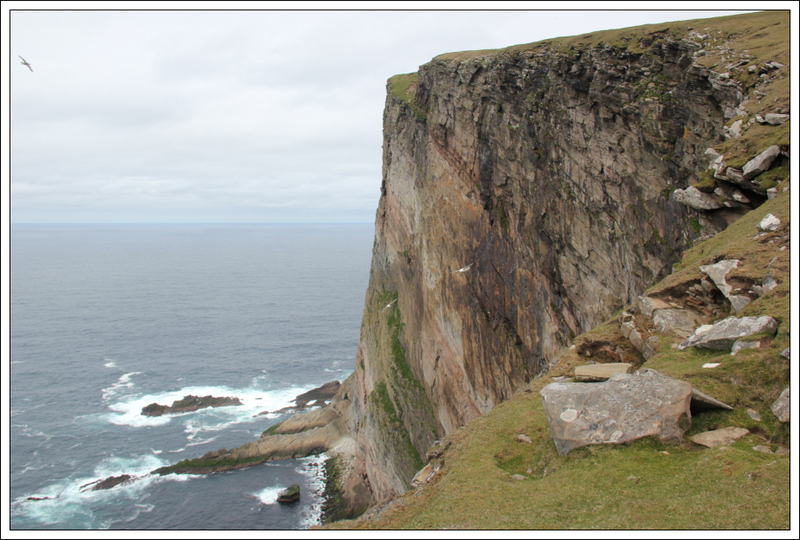 As we progressed towards Da Sneug, we began to see the cliffs at the west end of Da Noup. 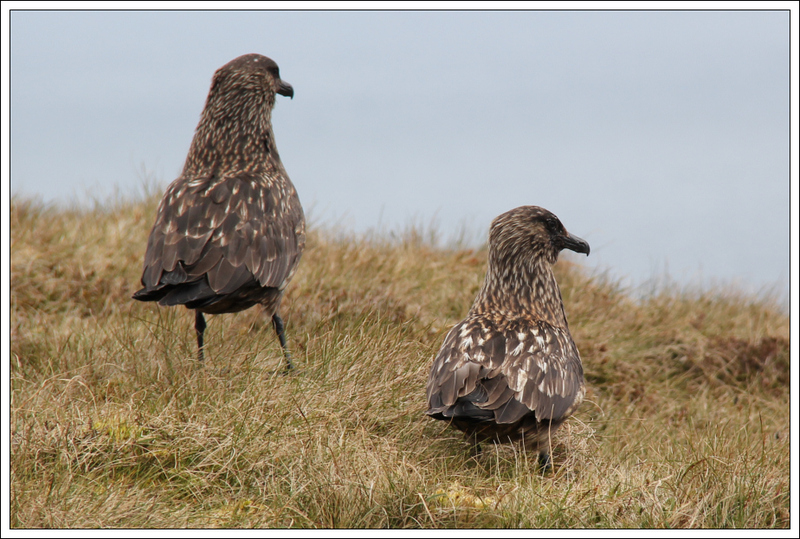 I could have photographed hundreds of Great Skua on Foula. Pretty-much everywhere you look you can see them sitting watching you. 1Hr 10Mins after leaving the plane we arrived at the summit of Da Sneug. 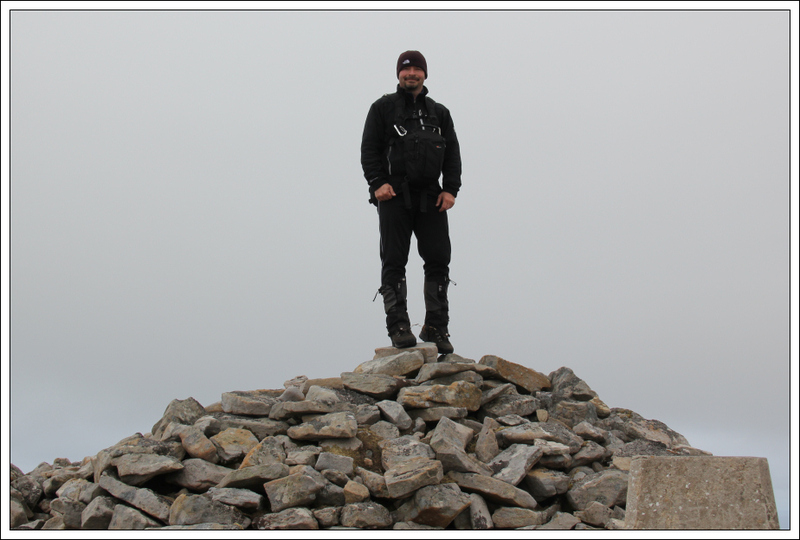 We spent a fair bit of time at the summit taking photographs. From Da Sneug, I suggested that we continue on to Da Kame. 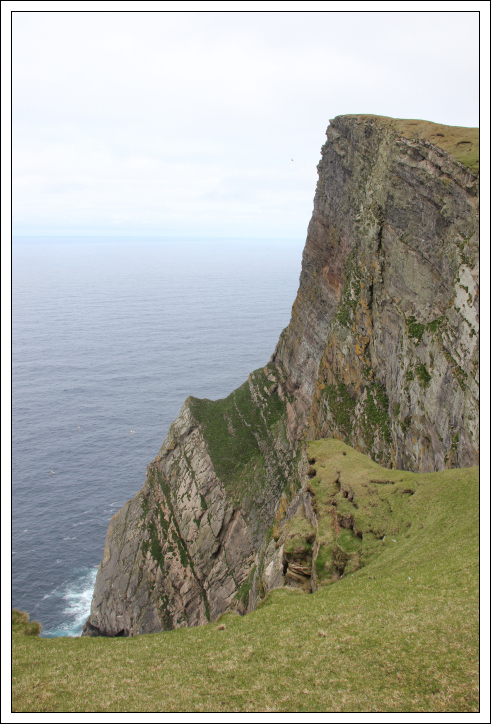 The 376m cliff at the back of Da Kame competes with Conachair (St Kilda) as the highest sea cliff in Britain. 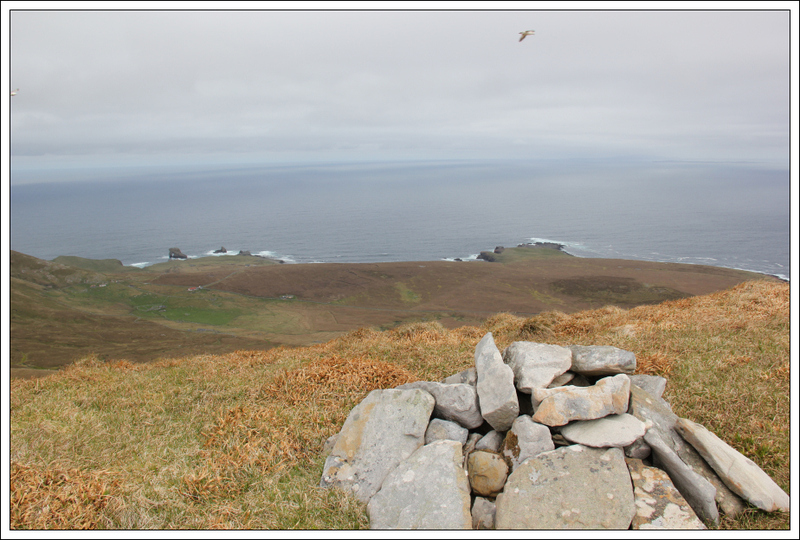 As we followed a faint sheep track between Da Sneug and Da Kame, we passed a nest with a couple of eggs. 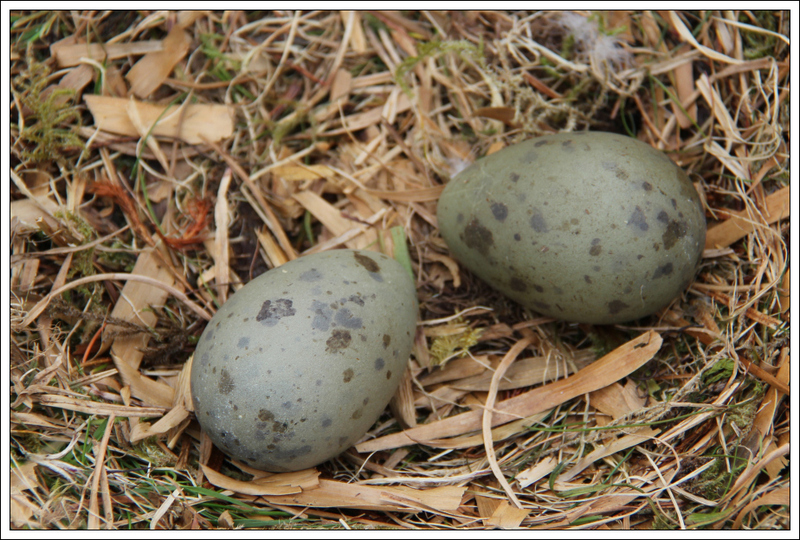 Given their size, I assume they are Skua eggs. 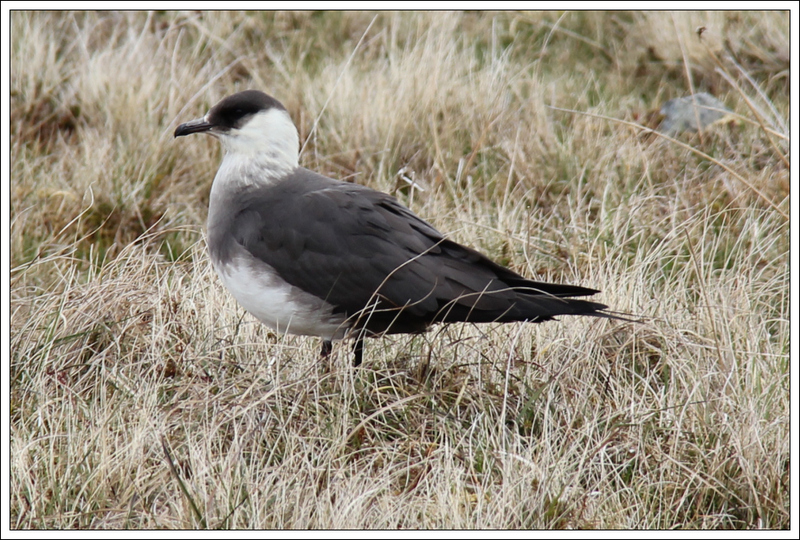 However, there were no parent birds nearby. Ascending Da Kame is really worth the effort. 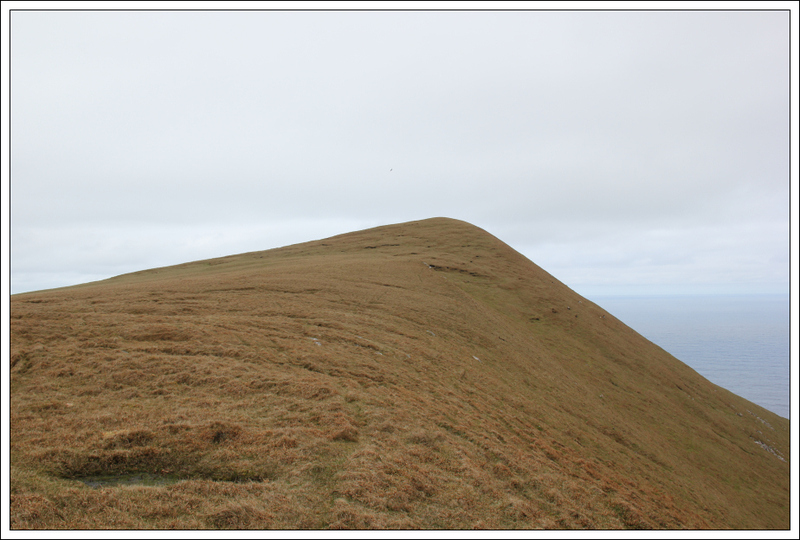 I ventured as close to the 376m drop as safely possible. 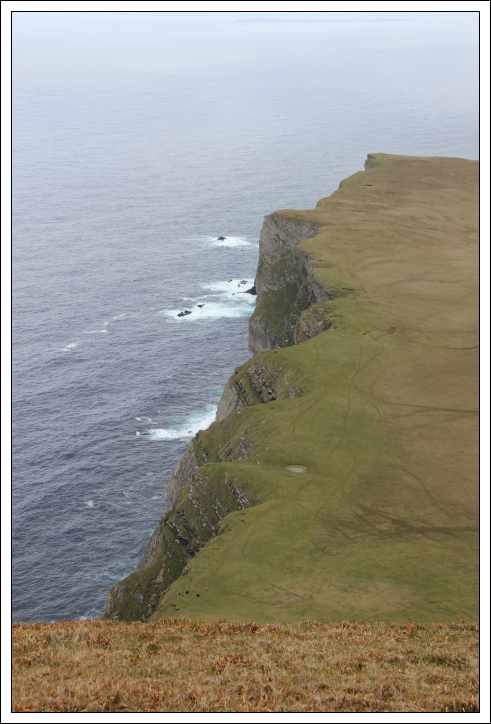 However the view over the edge is limited. 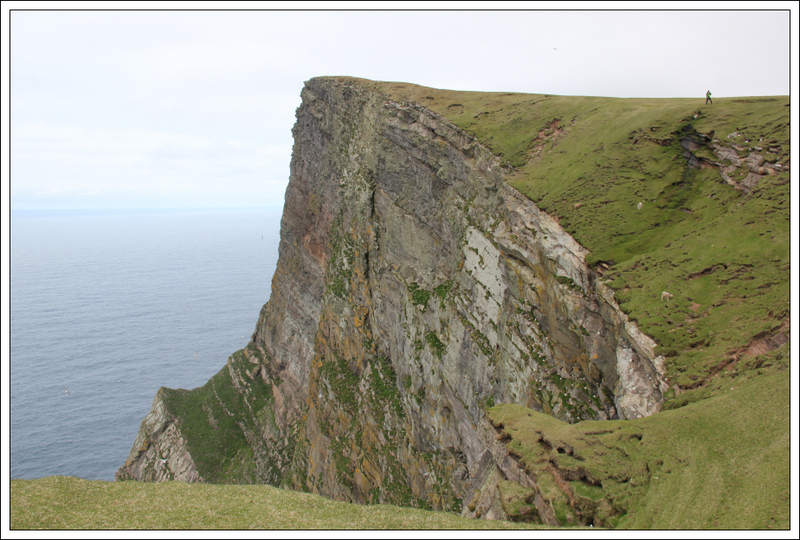 It wasn’t until we started to follow the cliff-edge down the coast that the sheer scale of these cliffs became apparent. 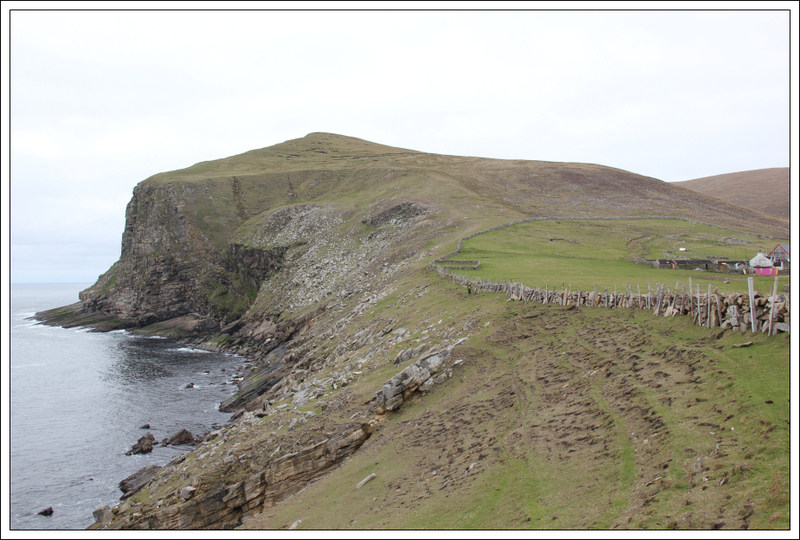 Foula has numerous multi-coloured sheep that are complete nutters. 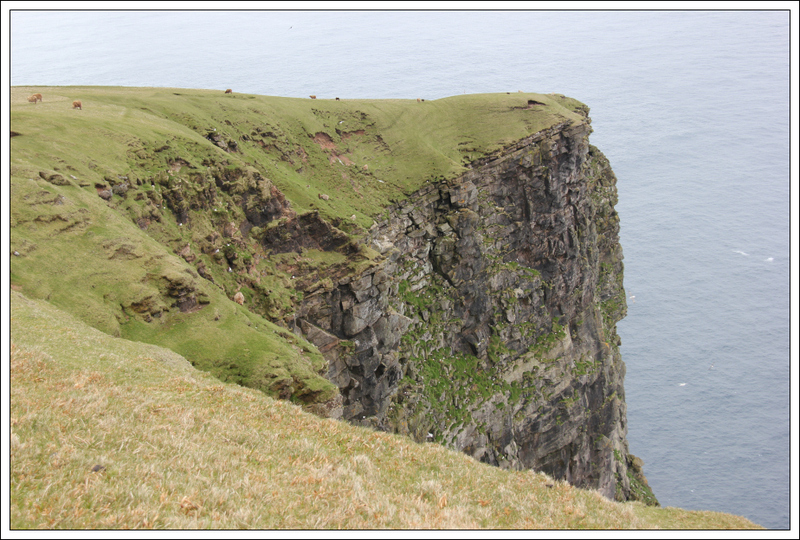 These sheep seem perfectly happy to wander right up to the cliff edge and beyond (see sheep below the fulmars on next photo). 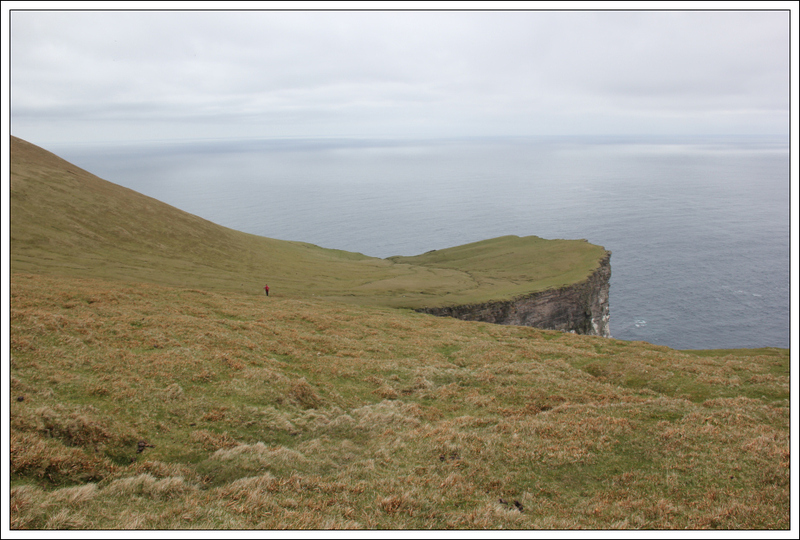 My photos don’t really give an idea of scale, although you can see Derrick standing above about the top one-third of the cliff in the next photo. From Da Kame we made our descent towards Waster Hoevda. 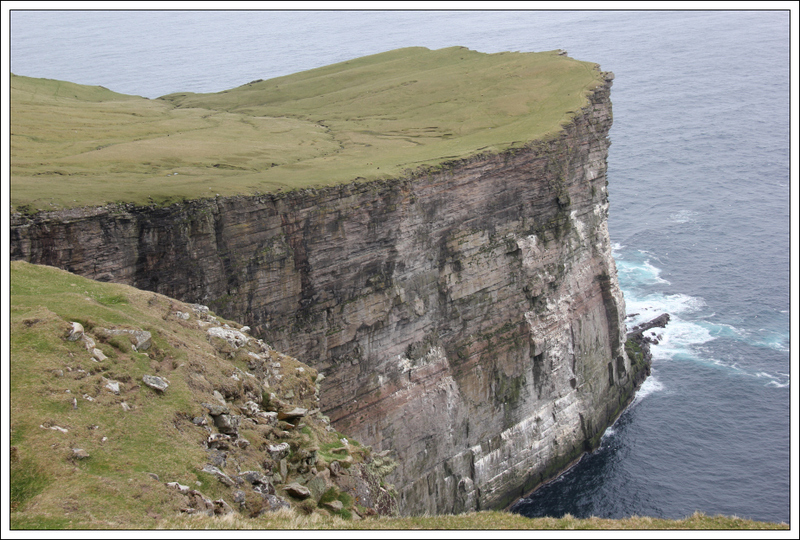 The Waster Hoevda cliffs, although less than half the height of Da Kame cliffs, are still really impressive. 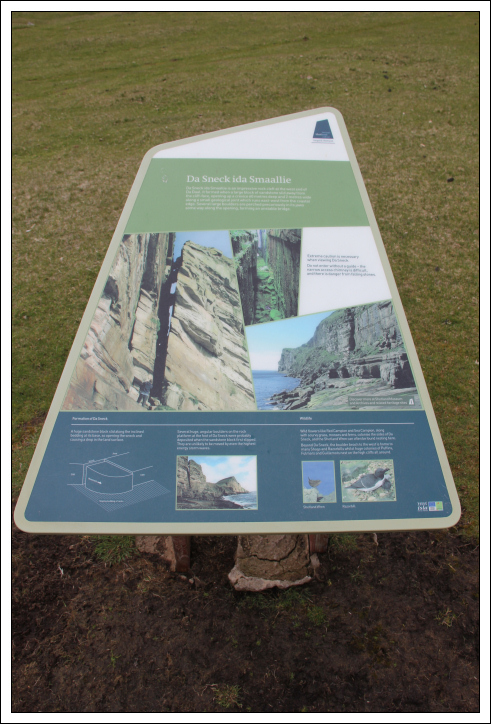 To by-pass the cliffs at Sandastack, we had re-ascend steeply for just over 100m. 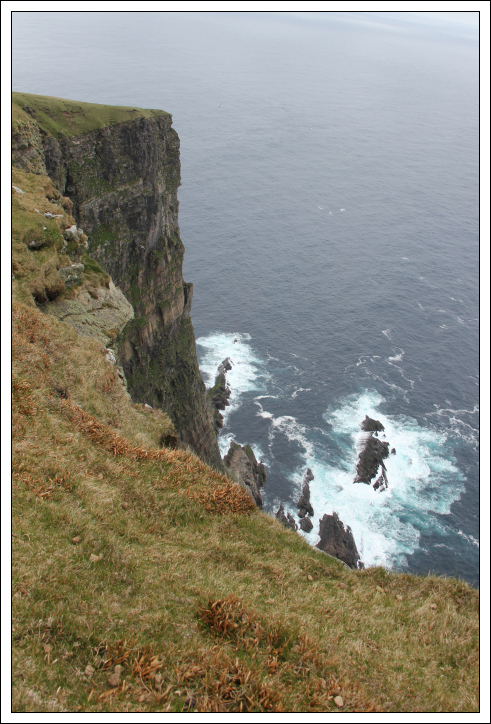 The cliffs here are vertical so you have to re-ascend. 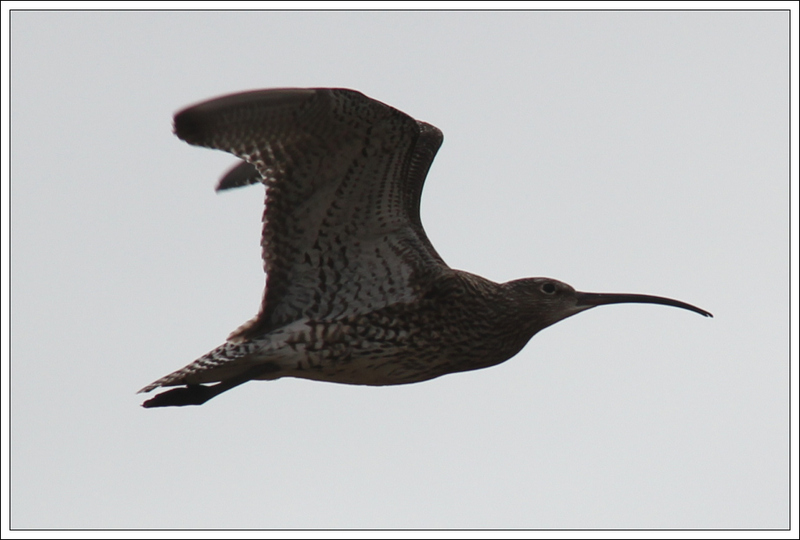 However, the re-ascent was worth the effort for the views of Da Noup from the North-West. 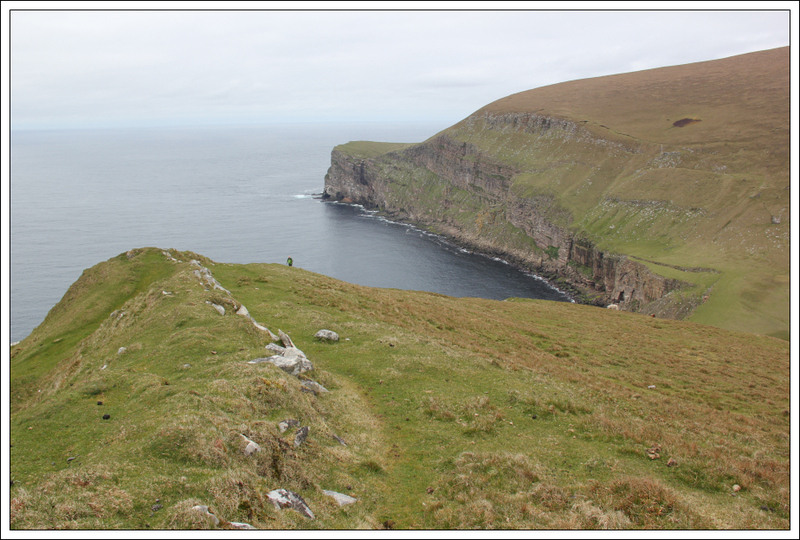 We continued to follow the coast descending to Da Smaallie. 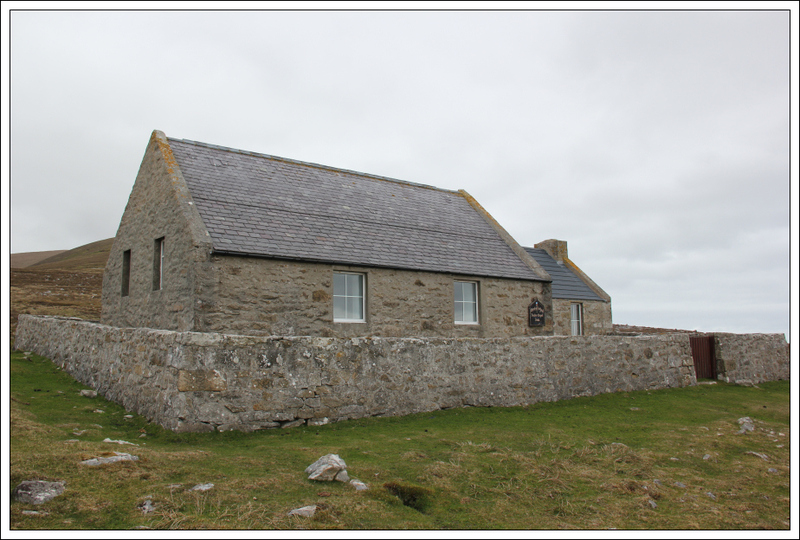 At Da Smaallie, we stopped for a look at Da Sneck ida Smaallie. 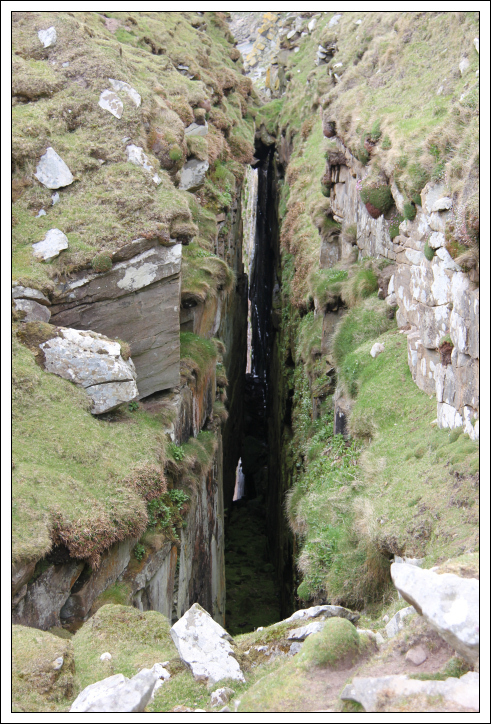 Da Sneck ida Smaallie is a rock cleft formed when a block of sandstone slid away from the cliff face, opening up a crevice 60m deep and 2m wide. 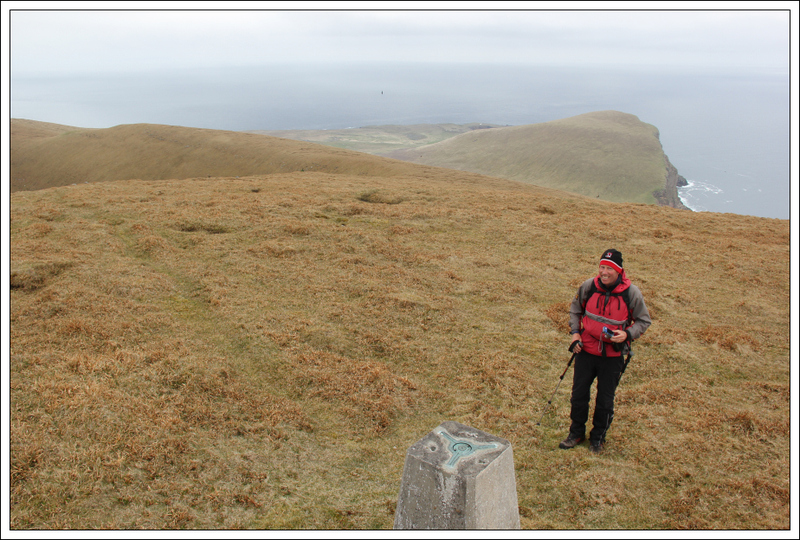 At Da Daal, John and Derrick had a short break while I continued on up the steep ascent of Da Noup. 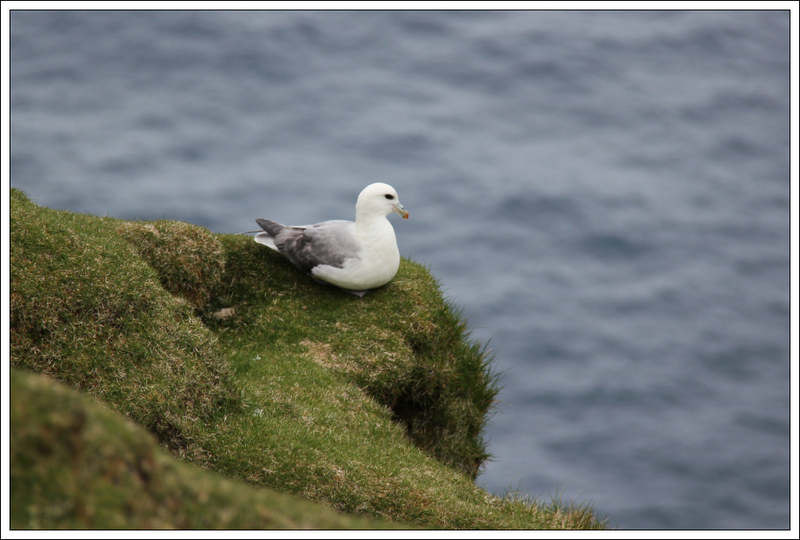 I initially stuck to the edge of the cliff but ended up having to move circa 10m inland as numerous fulmar were getting excitable with my presence and I preferred to avoid their projectile vomit. 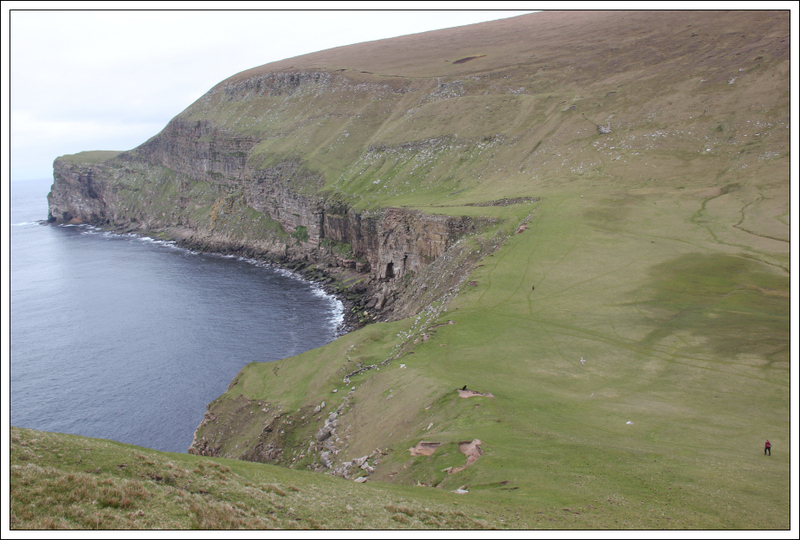 The next photo shows Wastar Hoevda to the far left and the cliffs that you have to re-ascend to avoid if following this coast. 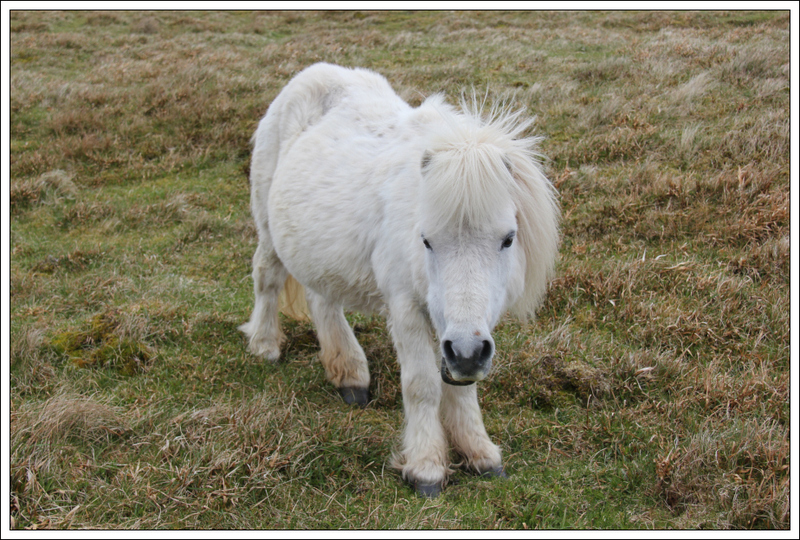 It was nice to find two Shetland Ponies circa 50m below the summit of Da Noup. 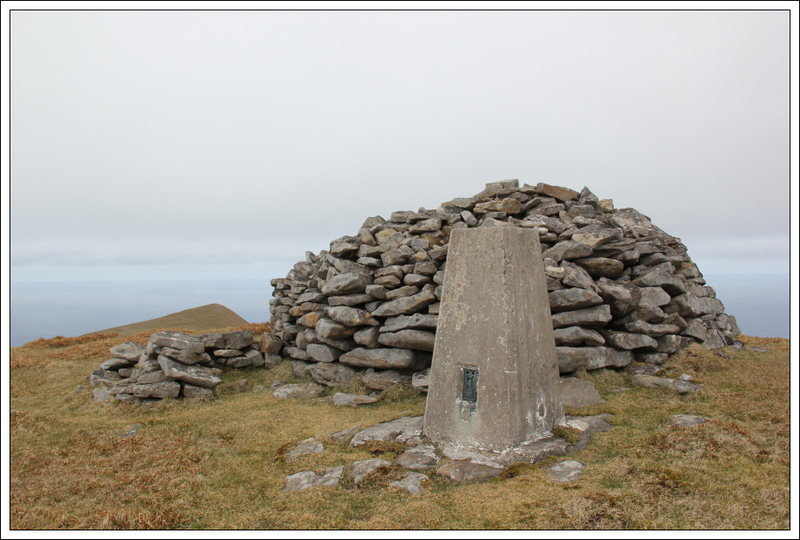 It was great to reach the summit of Da Noup, the second Marilyn on Foula. 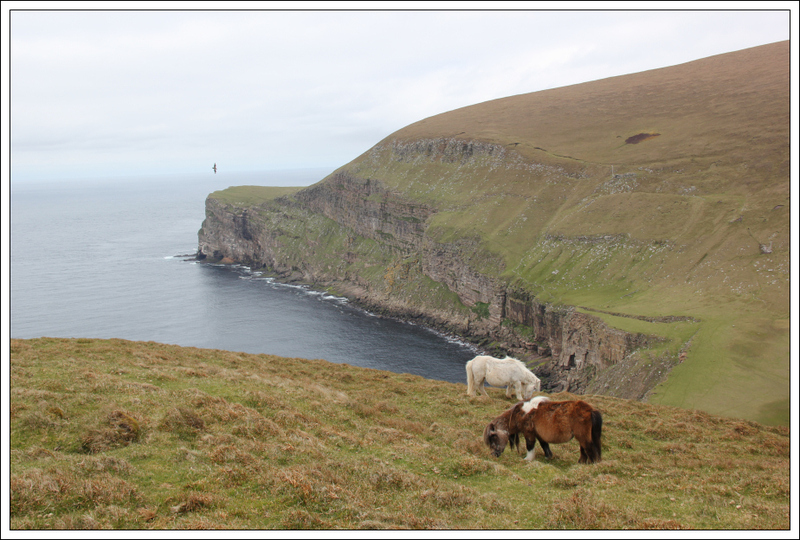 From Da Noup, we continued to follow the coast, descending towards Da Sooth Ness. 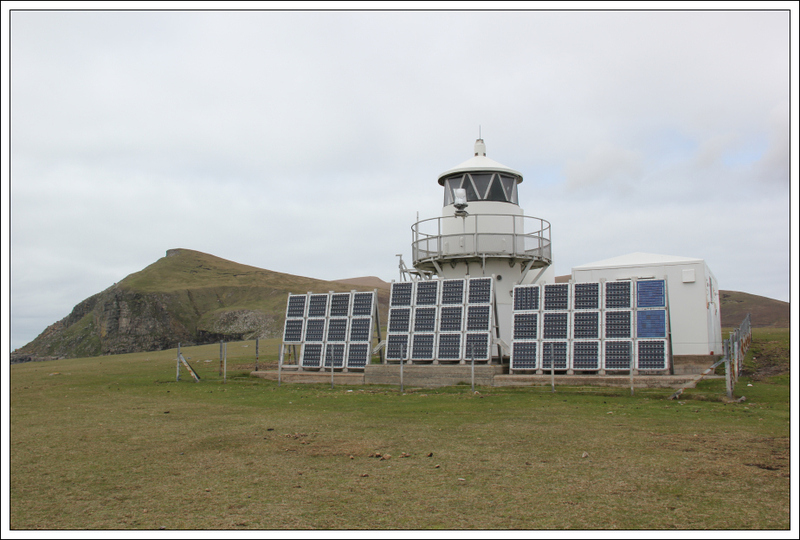 As we still had plenty time available before our flight back to Tingwall, we decided to visit Da Sooth Ness lighthouse on the way back. 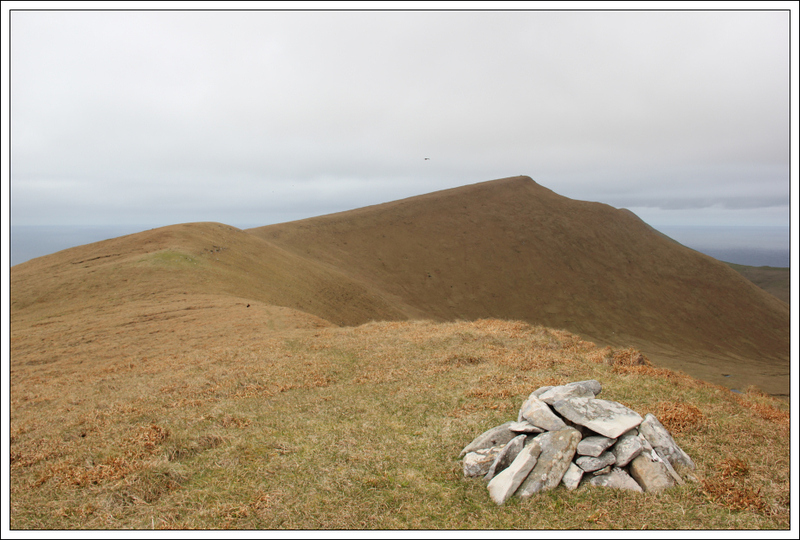 This is a fantastic walk with great hills, great geology and great wildlife. 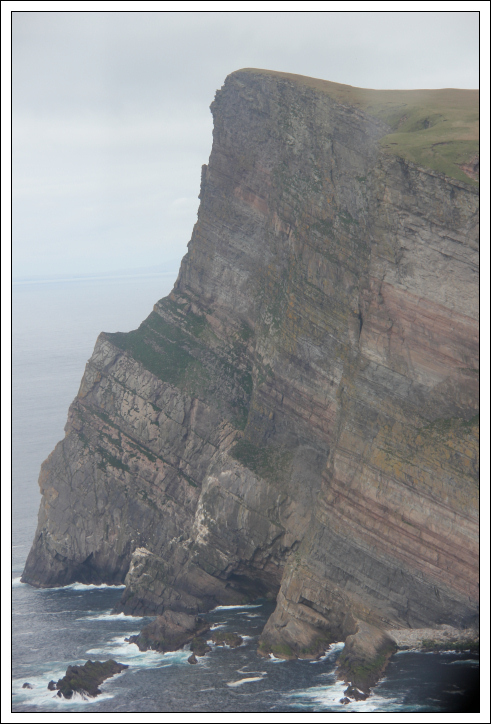 During the flight back, the pilot circled Foula to allow us to get a better view of the Da Kame cliffs. 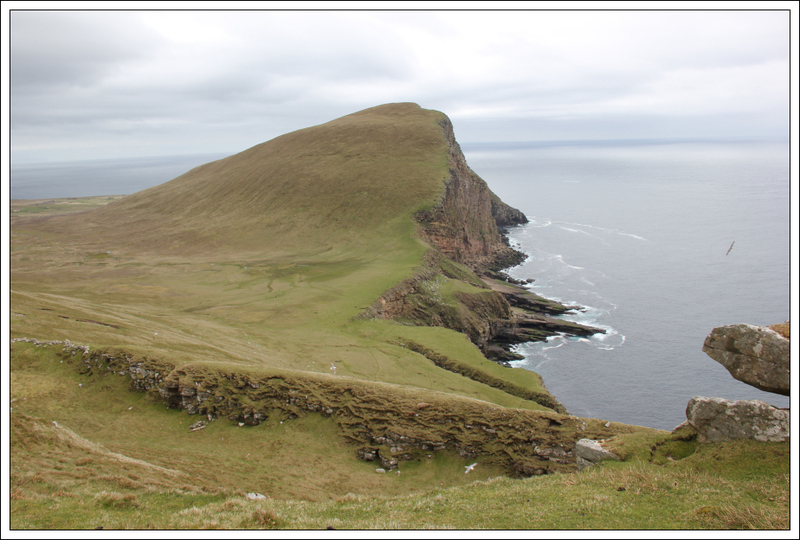 If you ever visit Shetland and have limited time available, the Isle of Noss, Foula and Fair Isle are seriously worth visiting.